This Chinese-Peruvian recipe, known as lomo saltado, breaks the unwritten rule that French fries should not be part of a stir-fry. It's also uncommon to find rice and potatoes served in the same dish. However, this rule-breaking meal is fantastic and one of the most popular dishes in Peruvian cuisine. 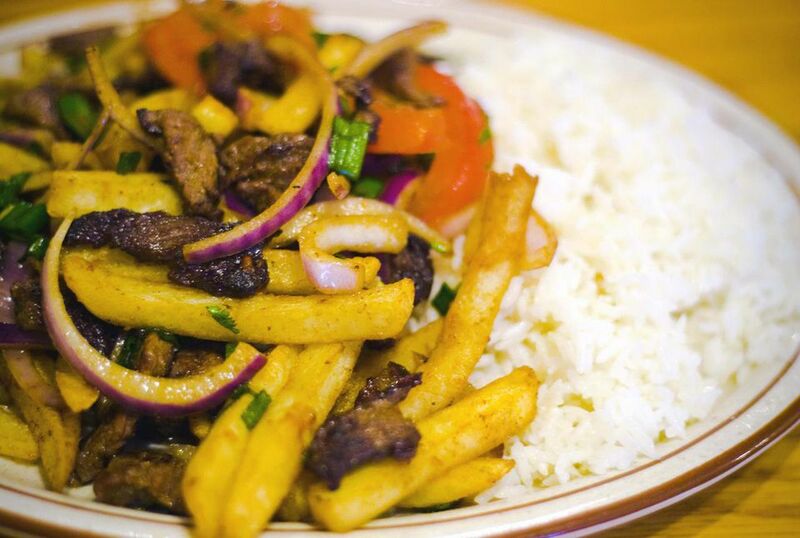 Lomo saltado is a wonderful fusion of Peruvian and Asian flavors. The beef tenderloin and vegetables are seasoned with both soy sauce and yellow aji chile peppers to create a memorable meal. And it really is a meal by itself, especially if you serve it with rice, because the starches are sure to fill you up. The recipe is easy and a perfect introduction to stir-fry. It can also be made with frozen french fries to make it a quick midweek meal. Peel and cut potatoes into 1/2-inch thick French fries and place in ice water. Set aside. Cut beef into thin 1/2-inch strips. In a skillet, heat the vegetable oil over medium-high heat. Sauté the garlic in the cumin for 1 minute. Add beef to the skillet and cook, turning often, until browned on all sides. Remove the beef from the heat and season it with salt and freshly ground black pepper. Set aside. Using the same pan, add the onions and the minced hot pepper and cook 5 to 6 minutes or until the onions are soft and fragrant. Add a little more vegetable oil if needed. Add the vinegar, soy sauce, red peppers, and tomatoes, and cook for 2 to 3 minutes. Remove from heat. In a separate pan, bring several inches of vegetable oil to 350 F over medium heat. Remove fries from the water and pat dry. Fry the potatoes in the oil until golden. Drain the fries on paper towels and season them with salt and pepper to taste. Add the beef to the pan with the onions and peppers and keep warm until ready to serve. Just before serving, add the French fries to the stir-fry.